How do I get Record Matches? Record Matching intelligently compares the one billion family tree profiles on MyHeritage to the more than 8 billion historical records on SuperSearch and automatically finds matches for you. If you have Record Matches you will see a notification appear on the side bar of the Home page in your family site alerting you that you have matches. Click on the notification to enter the results page or click on the ‘Discoveries’ tab. You don’t need to do anything to get Record Matches. We do the work automatically behind the scenes and notify you if matches are found. Processing over 8 billion records relevant to your tree takes time, so please be patient if you haven’t received records yet. You’ll receive an email when matches are found and you’ll see them on your family site. 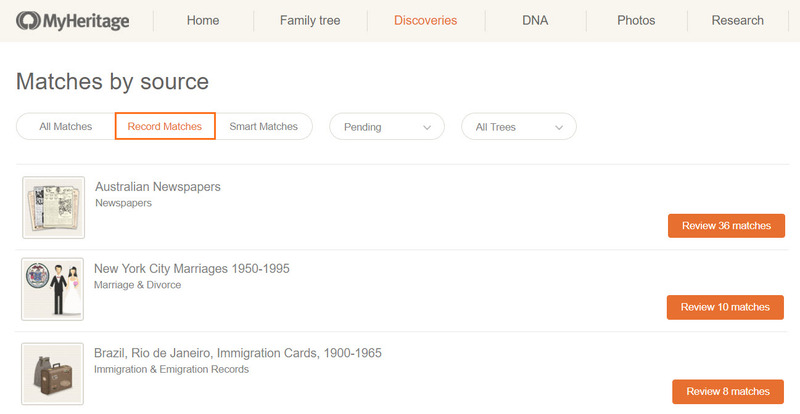 The Record Matches feature runs for free for everyone who has one or more family trees on MyHeritage. Viewing the matches is free, but viewing full records and their scanned images or newspaper articles requires a Data Subscription which is the same subscription used to view records on MyHeritage SuperSearch, – our search engine for historical records.